As an advertising photographer I know that no matter how tight the layout, often it's only a starting point for the visuals. For Fallon's BMW campaign I brought along tungsten hot lights and a generator even though night or dusk shots were not called for in any of the layouts. Sure enough, as we were reviewing the last of the scouted locations, the creative director and I decided to add a shot of the bike on this perfect stretch of road - we needed to work fast in order get the last light left in the sky in the shot. After rigging a 1000 watt light to an outrigger arm at the back of the camera car and firing up the generator, we were able to have a constant light source traveling with us illuminating the bike keeping pace behind us. I shot 2 rolls of 1 second exposures (to streak the treetops moving by) on my stomach from the camera truck's tailgate dropped to its lowest level before we lost the light in the sky. 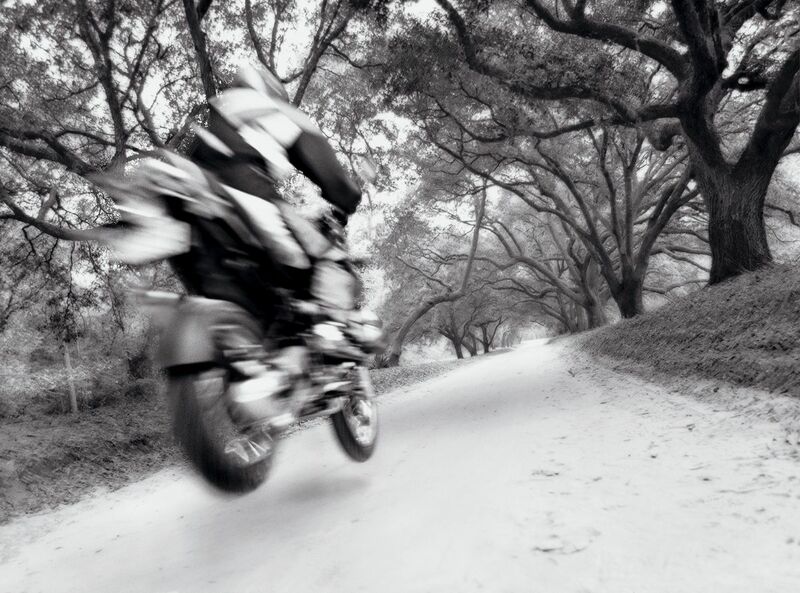 For another shot in the BMW campaign, we were setting up on a dirt back-road lined with majestic old oaks. 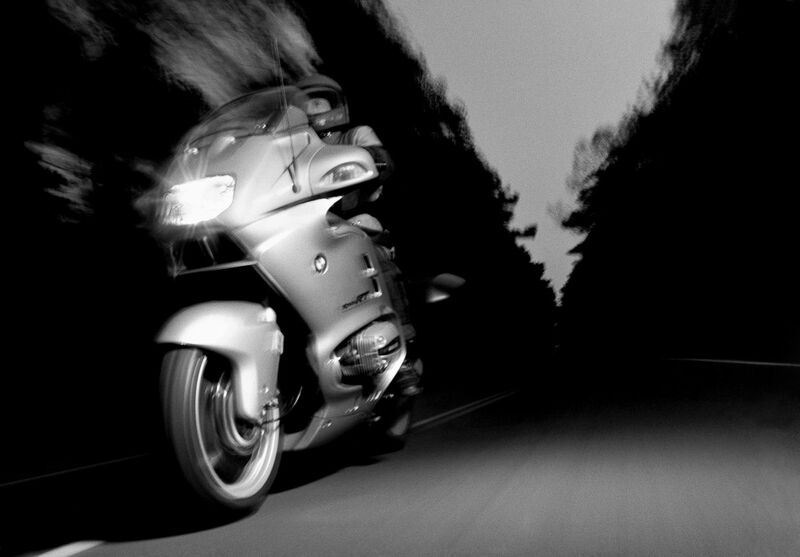 The bike was to pass close to me from behind (our biker was a great stunt rider from BMW who I was instructed to trust) while I shot film of the rider speeding away from me down the road. We did a few passes when Marc, the art director said, "wish we could get him in the air". That meant that we needed a ramp ideally around 20 feet long, at least 24 inches wide with a heavily textured surface, made of steel so as not to flex when the bike hit it going 35 - 40 mph and we needed it immediately. A quick look at our rental truck made me realize we had exactly that. I instructed my crew to detach the loading ramp of our rental truck and propped up the end with several large logs. We set up and adjusted the timing on the laser delay trigger for the camera shutter and shot several rolls of film of the bike airborne in the perfect spot. An interesting technical problem presented itself when we were considering how to get a high overhead shot for an AT&T Wireless ad campaign. 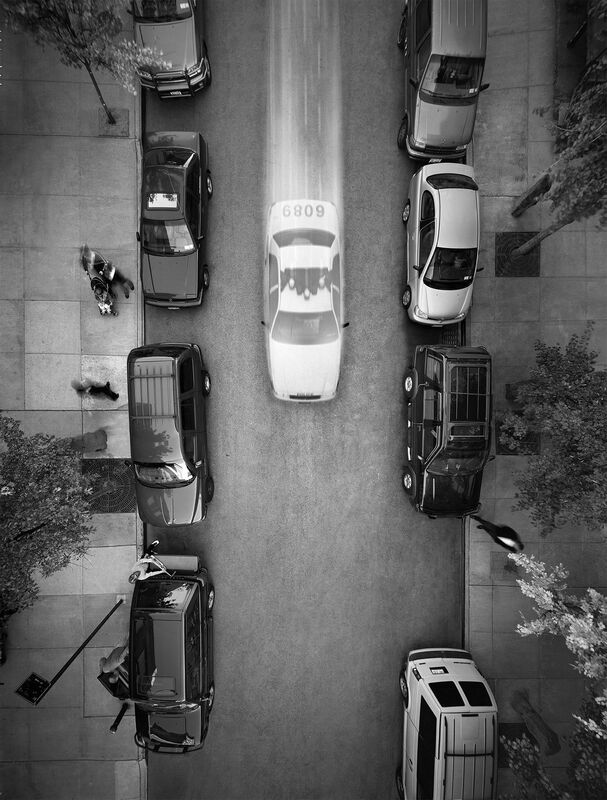 One of the ad layouts called for a bird's-eye view of a blurred police car speeding down a New York City street. The others included a construction site with a foreman and workers in motion, an assortment of ductwork laid out with moving workers taking inventory, and a delivery truck making a delivery at curbside with moving pedestrians on the sidewalk. For the New York City street shot, the camera had to be perfectly still to allow 1-second exposures free of visual obstructions (e.g., the support structure of a scissor lift). A cherry-picker was out – it would move even in the slightest breeze. The camera would have to be sent 40 feet up on its own to avoid movement caused by wind and people. We rented a jib crane and mounted the camera to it's head. I pre-focused the camera matching the distance the camera would be from the ground when aloft, attached a long air-release to the shutter, pivoted the crane arm up to a position we were able to duplicate each time and shot the job. A video camera was mounted next to the camera - its feed to our ground level monitor allowed us to frame the shot and direct the talent. With my feet on the ground, I was able to save my voice while directing crew and review the images with the creative director. Her reaction to the unconventional crane solution was, "simply elegant." One of my favorite experiences on assignment has to have been while working on an ad campaign for a new Kodak product. I was sent on location to create an image using this new product and I would be working alone - the only art direction given to me was that the images had to be food-related. 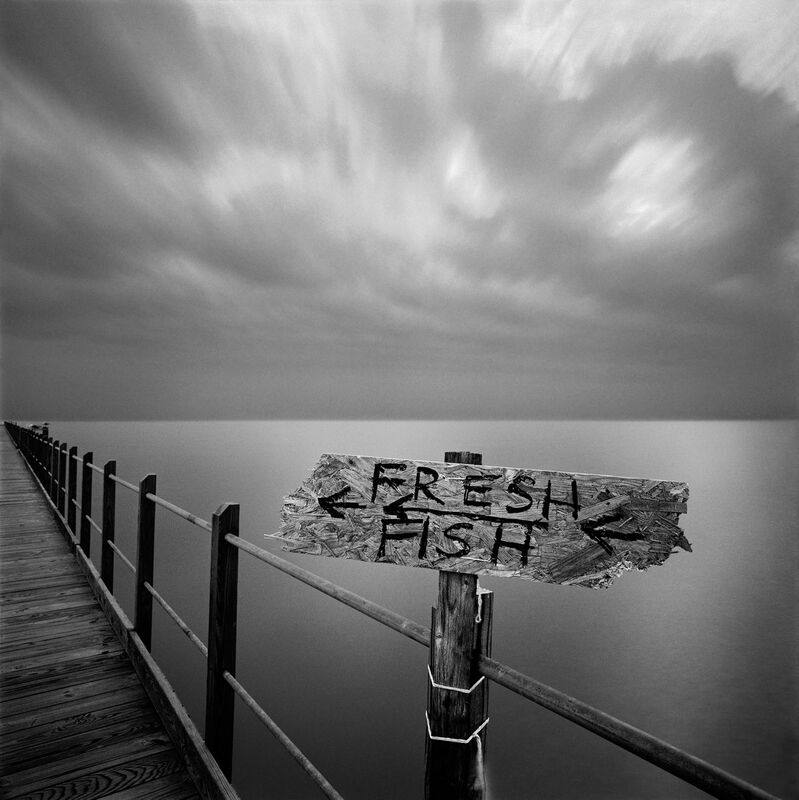 While driving around Alabama and Mississippi looking for good roadside eatery visuals, I ended up in Biloxi, Mississippi where I spied a handmade "Fresh Fish" sign mounted to a pier railing. The crude, particle board sign framed by a background of rapidly moving clouds and a sheen of the water in the foreground, had the all makings of a compelling composition. As I set up the shot, a young boy approached me and watched. He asked why I was taking a picture of his sign and I told him it was kind of neat. When I asked what kind of fish he was selling, he told me, "all sorts." After a pause, he asked if I wanted to buy some fish. I told him I would but I was traveling in a car with no place to cook it. We agreed that raw fish in a hot car wasn't a good idea. I continued working while he watched, and sensing his need to make a sale, I eventually asked if his sign was for sale. He lit up and said, "Yeah! I can make another one tonight and I'm almost done today anyway". We agreed on $10.00, shook hands and I put the sign in my car - it hangs in my garage to this day.